With the arrest of five persons belonging to the Bawaria gang of dacoits, the North-West district police today claimed to have recovered 112 bags of rice worth Rs 3 lakh along with a Tata-407 from their possession. The newly elected team of the Delhi Medical Association (DMA), which officially took charge yesterday, has announced its decision to get cracking against quacks. 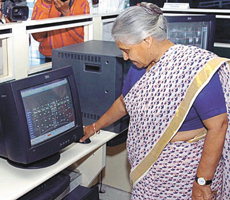 Chief Minister Sheila Dikshit today inaugurated Delhi’s first Information Technology Park, developed by the Delhi Metro Rail Corporation at Shastri Park. Chief Minister Sheila Dikshit after the inauguration of Delhi's first Information Technology Park in East Delhi on Saturday. The district court awarded death sentence to a man today for killing his wife and minor son. The man’s brother-in-law who had helped him in the crime also got death penalty. The former Additional Commissioner, Education, MCD, Mr Raj Mohan Singh, said that he was being victimised by the Municipal Commissioner’s secretary, Mr G. S. Matharoo, for opposing corruption in the corporation. Six police sub-inspectors, including the staff officer of Javer police station, have come under suspicion in the case of missing, presumably murdered three Dadri junk dealers. Indian students wanting to pursue education in the foreign universities are being spoilt for choice. Following the incursion of universities from the US and the UK, the country is now being approached by the Chinese universities, promising quality education at an affordable price. The Delhi State Industrial Development Corporation today clarified that a joint inspection was carried out by the CBI along with officials of DSIDC on the sand points at ITO and Majnu Ka Tila and not DSIDC godowns as was reported yesterday. Delhi Chief Minister Sheila Dikshit inaugurated the 24th Annual Bonsai Exhibition organised by the Indian Bonsai Association at the Kamal Mahal Hall, Hotel ITC Maurya Sheraton. The exhibition will be on till April 3. The Member of Parliament, Mr Sajjan Kumar, inaugurated the first carriageway over Palam drain from Dwarka to Pankha Road. This carriageway is being developed by DDA as part of the project of covering the Palam drain. The issue of water–construed to be one of the most contentious subjects before the Hooda government in Haryana—takes another turn following the suggestions of certain state Congress leaders to construct a new canal from Narwana to Panipat. A Delhiite consumes less water than a Mumbaikar, according to a study conducted by the Tata Institute of Social Sciences. The study was conducted to analyse the pattern of consumption of water by households and tabulate the wastage of water. A computer software company manager is planning to develop broadband technologies in India. A demonstration has been planned by ‘Pawan Putra Rehri Patri Komcha Sangh’ at Jantar Mantar on April 12 in protest against the ‘atrocities’ meted out to them by the Delhi Police, MCD and the NDMC. The local and indigenous cultural activities available in the immediate environment of a child should be part of the education, the CABE Sub Committee on Integration of Culture Education in School Curriculum has proposed. The police also recovered one country- made pistol, one live cartridge, two button-actuated knives and two iron rods from their possession. They were identified as Jansi (25), Partap (30) and Chiranjee (22), residents of Rajasthan and Subhash (40), resident of Narela and Arvind Rana (22), resident of Rohini. Acting on a tip-off that the gang members of Bawaria tribe would assemble near GT Karnal Road to commit dacoity, the police laid a trap and nabbed them after a brief encounter. During interrogation, the accused persons disclosed that they were involved in at least eight cases of looting trucks in Alipur area. In another case, the East district police today claimed to have busted a gang of robbers involved in several cases of robbery in the district apart from Ghaziabad and Gautam Budh Nagar. Acting on a tip-off that the criminals were planning a dacoity in Pandav Nagar area, the police laid a trap and nabbed the suspects. They were later identified as Dharmender, Vipin George, Umar Ali, residents of Ghaziabad and Pankaj, alias Sonu, resident of Fazal Pur. During interrogation, the accused persons revealed that they were working for Pankaj and were involved in a spate of robbery cases in the last 20-days. They had hired an auto-rickshaw and looked for targets near bus stops, cinema halls and restaurants. 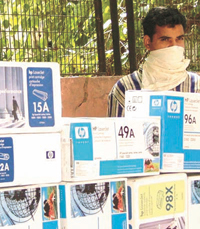 With the arrest of one person, the Crime Branch today claimed to have unearthed a fake-manufacturing unit of toners and seized printer cartridges, toners and packing materials worth several lakhs of rupees. The accused person has been identified as one Mohammad Munna, resident of Moradabad. Acting on a tip-off that a resident of Jama Masjid has been indulging in manufacturing of sub-standard print cartridges and toners of reputed companies, the sleuths raided the premises of the accused and nabbed him. The DMA, which has chosen ‘Meri Dilli Swastha Dilli’ (My Delhi, Healthy Delhi) as its theme for the year, is aiming to “root out quackery from the city”. Listing out the key areas of interest, the DMA president, Dr K. K. Aggarwal, said the DMA plans to file a Public Interest Petition in the High Court seeking clarification on those who can prefix ‘Dr’ before their names. He said the DMA asserts that Allopathic, Ayurvedic, Homoeopathic and Unani practitioners, who are registered with their respective councils, can have this designation. This leaves out the Naturopaths and other streams like Physiotherapists, he added. Dr Aggarwal said the plan is to make it legally impossible for quacks to use this designation to fool people as they will not be allowed to prescribe drugs under the schedule G, H and X categories, which only a registered Allopathic doctor can. He went on to add that the DMA is planning to make nearly 27,000 doctors in the Capital registered with them IT savvy so that they can have all patient records on their computers and have access to internet to improve patient care. The other members of the team present today included Hon. secretary Dr Girish Tyagi and Hon. finance secretary Dr V K Narang. Chief Minister Sheila Dikshit today inaugurated Delhi’s first Information Technology Park, developed by the Delhi Metro Rail Corporation (DMRC) at Shastri Park. The IT park, located in the heart of the city, is within a short drive from the key residential and commercial locations in the Capital. Set up on a six-hectare plot just off the GT Road, the park is designed with three large buildings, each with a floor specially designed for software development and computer-based services. It is well connected by the road as well as the Metro and has parking for about 800 cars. The first and the second floors of the Block I have already been leased out and there is a proposal to rent out the remaining floors to the reputed IT operators. The three buildings, each with a floor space of approximately 30,000 sq m, have all modern facilities, designed especially for software development and computer-based services. The state-of-the-art facilities include high-end communication facilities, fail-safe power supply, scalable international quality business space and an intelligent building management system with electronic access, smart cards, CCTV, round-the-clock monitoring of electrical, air-conditioning, elevators, etc and a fire detection system. The inaugural function was attended by Minister of Finance, Planning, Urban Development and PWD A.K. Walia, Transport Minister Haroon Yusuf, DMRC Managing Director E. Sreedharan and DMRC Chairman Anil Baijal. This landmark judgement was delivered by the court of the Additional District and Sessions Judge, Mr R.S. Virk, to two residents of Ballabhgarh town here for the cold-blooded murder of a woman and his minor son in 2003. According to the prosecution, the convicts identified as Gopi (36), residing in the Punjabi Mohalla of Ballabhgarh town, had allegedly hacked to death his wife Ramvati (30) and his son Rahul (6). His brother-in-law, Bhupender, reportedly helped him in the crime. It is learnt that the convict was addicted to lottery and there had been regular quarrels between him and his wife over his habit of playing lotteries. He also suspected the character of his wife, as he told the police during investigation. It is reported that initially the accused had informed the police that someone had killed his wife and son, while they were alone in the house. However, the suspect could not prove his alibi during interrogation and broke down. He admitted that he had committed the crime with the help of his brother-in-law. The District Court after hearing the arguments from both sides sentenced the two to death, in view of the heinous nature of the crime. The District Court had earlier awarded similar sentence to five persons in connection with multiple murders, involving two families of Budena village in the district, a few months ago. Meanwhile, five youths snatched about Rs 18,500 from a resident of Bhadkhal village last night. The criminals also beat him up before fleeing. The victim identified as Ishaq has been admitted to the civil hospital. In his complaint to the police, he said that he was going on a motorcycle last night, when the youths standing at a place near petrol pump at Bhadkhal Crossing, intercepted him and started beating him before snatching the cash. They also threatened him with dire consequences, he said and added that he was going to deliver the money to the driver of his dumper truck. A case has been booked. A person, found guilty of making and selling duplicate drugs, has been sentenced to life imprisonment by the Court of Additional Sessions and District Judge, Ghaziabad. The court has not pronounced any sentence for K. M. Y Khan, father of Shams Alam Khan, who had also been found guilty of the same charge, as he is no more alive. The father-son duo used to manufacture drugs of internationally known drug companies. They would carry out their trade in their Vasant Vihar residence in Delhi and market them in nearby areas. I. G. Sehgal, Inspector in Controller of Drugs Department, North zone, Ghaziabad, in a raid on February 21, 1976, at Ramte Ram Road, Ghaziabad, had arrested Shams Alam Khan, a resident of E-6/9 Vasant Vihar, Delhi. Intravenous injections and other veterinary drugs were seized from his premises, which were found to be fake and duplicate on testing. According to a government official, Ramesh Chand, a case was filed in the court of CJM against Shams and his father K. M. Y. Khan on November 26, 1976. The accused had tried their best to prolong the case and even gone to the High Court. In 1984, Shams’ father died. Mr Ramesh Chand said that the case had been sent back to Ghaziabad court by the High Court on July 31, 2004, after 20 years. He has refuted the charges of framing an Arms Act case against the secretary in Ranchi, demanding a CBI inquiry into the entire episode. He alleged that there was a scam to the tune of Rs 1,750 crore in the procurement of mid-day meal for the MCD schools. “I opposed it as Director of Education and have since been victimised for doing so,” he alleged. While addressing the newsmen, he said he was simply following the Supreme Court’s guidelines in opposing the contract for 2003 to a supplier of pre-cooked food as the Apex Court had given an order on a PIL that only cooked food should be given in schools. “It was a major scam. But afterwards, I was victimised. A vigilance case was started against me, I was demoted. A CBI raid was also conducted against me,” he said. Mr Singh has since been suspended. Mr Singh’s son, Manoj, who is a SC lawyer, who has been named in a FIR by Matharoo as having come to his office to threaten him, refuted the charge, saying he had proof to show that he was in the Court at that time. He also denied the charge that they had framed Mr Matharoo in an arms racket case, saying. A team of CBCID (intelligence and investigative wing of UP), asked to probe the case, had summoned six SIs, including Javer SO in Kasna police station. S.P. Akshay Kumar Singh of CBCID had interrogated them all individually and taken their written statements. Another CBCID team under Rajesh Kumar is collecting proofs by visiting different areas. Mr Akshay Kumar Singh has also had a meeting with SSP Piyush Mordia at Surajpur police station for over an hour, it is learnt. First of all, he had quizzed SO Javer, Pawan Chaudhry waiting for him at Kasna police station and got a written statement from him also. Besides, SI Sanjeev Kumar of Noida Sector-20 police station, SI S. Kumar of Sector 58 police station, HCP Attar Singh Meena of Phase II police station, HCP Ranveer Singh of Dadri police station and HCP Ram Babu of Kasna police station were quizzed by SP Akshay Kumar Singh separately. All the six SIs were posted at Kasna police station on September 26, 2004, when the security guards had handed over the three junk dealers of Dadri to police. The inquiry team is understood to have gathered valuable clues after questioning the SIs. The Link Road police in Sahibabad have nabbed two persons for smuggling wild animals’ skin. The police have recovered a leopard hide worth Rs 1 lakh on the international market. The accused told the police that they had brought the hide from Bareilly. A police team has been sent to Bareilly to connect the missing links. The smugglers were nabbed when the Special Officer of Link road police station, Mr Shushant Chaudhary, was conducting a vehicle check with his team. Police noticed two men walking in a suspicious manner. When frisked, a leopard skin was found folded in a shoe carton. During interrogation, the accused were identified as Atik Khan and Mohd Siddique. They also told the police that the ringleader of their gang, Mamnoon, son of Kallan, is a resident of Mirganj, Bareilly. They had bought the hide from him and were going to sell it in Ghaziabad. The SO said a team has been sent to Bareilly for tracing Mamnoon Loni. A year ago, Atik had been booked for selling smack. About 25 Chinese universities are scheduled to participate in the forthcoming India International Education Fair beginning in the city on April 8. The three-day event at Pragati Maidan will have representation from China, showcasing the best they have to offer to the Indian students. These universities come under the aegis of the China Scholarship Council (CSC), a non-profit corporate directly under the Ministry of Education in China. The CSC is responsible for organising and financing the study of both foreign students in China and the Chinese students who opt to study abroad. The CSC General Secretary, Ms Zhang Xiuqin, accompanied by senior officials, is scheduled to participate in the event. It was pointed out that Chinese universities have different teaching patterns for different students. Junior undergraduates are required to study for two to three school years according to the teaching programmes and senior undergraduates are required to study four to five school years according to the teaching programmes. She added, “We wish to explore the Indian market more and more and based on the response from this venture, we would formalise the future plan of action.” Among the participating universities are Peking University, the Beijing Institute of Technology and Fudan University. The Delhi State Industrial Development Corporation (DSIDC) today clarified that a joint inspection was carried out by the CBI along with officials of DSIDC on the sand points at ITO and Majnu Ka Tila and not DSIDC godowns as was reported yesterday. It would be not only incorrect but also defamatory to use the term ‘raid’ on DSIDC godowns, statement released by DSIDC read. It said that the CBI had yesterday asked for the cooperation of DSIDC in conducting joint inspections and accordingly, the DSIDC officials were provided to them. The DSIDC said that the CBI had received some complaint about lifting of sand by private supplier and supply to Delhi Metro Rail Corporation. It further said that inspection of records in DSIDC was going on with the “assistance, cooperation and knowledge” of the DSIDC officers. More than 300 Bonsai trees were displayed. Flowering as well as fruiting trees like Bougainvillea, Star Jasmine, Patrea, China orange, Pomegranate, Cheeku, Mulberries, etc., were displayed along with revered and old trees of different varieties. More than 50 years old trees belonging to the founder president the late Dr Liela Dhanda and Dr Tayebbhoy’s Salvadora were displayed. “I am really fascinated by this fine art and hope that this will come out with more and more green colours,” the Chief Minister said. To grace the occasion, Japanese ambassador and renowned masters from three different countries have participated in this event. The visiting international masters who are conducting the programme are: Mr Robert Seteven from Indonesia, Mr Hirotoshi Saito from Japan, and Mr Peter Chan from England. The exhibition is one of the best in Asia and is being visited by a large number of people and has always been greatly appreciated. From time to time, this exhibition has been graced by many political and creative personalities like Mrs Usha Narayanan, Mrs Sonia Gandhi, Mrs Sushma Swaraj, Mr Amjad Ali Khan, Mr Madan Lal Khurana, Mr Arun Shouri, etc. Mrs Sonia Gandhi even displayed her Maple Bonsai in the exhibitions. The art of Bonsai is Chinese in origin. The Japanese, fascinated with the miniaturisation of the tree, took it across the sea. Under meticulous care and infinite patience, it grows into a fine art. 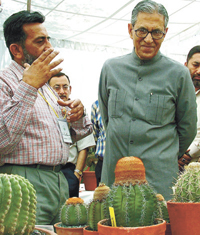 “Although I don’t now much about bonsai plantations, this exhibition has really given me a chance to be with nature and to get familiar with different kinds of trees and shrubs found in the country,” Mrs Dikshit said. The Member of Parliament, Mr Sajjan Kumar, inaugurated the first carriageway over Palam drain from Dwarka to Pankha Road. This carriageway is being developed by DDA as part of the project of covering the Palam drain. Mr Mahabal Mishra, MLA and Authority Member of DDA, area Councillor and senior officers of DDA were present on the occasion. The first carriageway is part of a project involving the covering of the Palam Drain and the construction of 45-metre road over it. The Palam Drain will be covered for 2.3 km and will be one of the four major road linkages for Dwarka sub-city. The work of covering the Palam drain will be completed at the cost of Rs 37 crore approximately. The issue of water–construed to be one of the most contentious subjects before the Hooda government in Haryana—takes another turn following the suggestions of certain state Congress leaders to construct a new canal from Narwana to Panipat. This canal will carry water to the southern districts of the state after the policy of an equitable distribution of water comes into effect.. The proposed canal has also been seen as an alternative to the SYL canal hanging fire for the past several decades. A demand has been made to allocate funds in the budget to be tabled in the Assembly in June. According to Mr Ved Prakash Vidrohi, head of the Gramin Bharat, a social organisation based in Rewari, the proposal to construct the canal is unique and it could solve most of the problems faced by the state government. It is the best time for the government to find ways to tackle the long-pending problem, he added. Mr Vidrohi said that a study conducted by experts found that the Bhakra canal, which supplies the main water share of Haryana, passed from a village located in the Narwana sub-division. In case a canal is constructed from this point connecting the canal in Panipat, which is a part of the Yamuna system, there is hardly any need to construct the SYL canal. He said this canal would be 80-km-long and could carry not only the additional water available in the northern districts, but could also be used to carry more water to be released by Punjab after an agreement on the dispute. Claiming that this project requires a budget of around Rs 250 crore to 300 crore, the canal could be functioning within two years. Moreover, it is important how much allocations are made in the budget, he said. Any amount of water that is to be released by Punjab should be given through the Bhakra system. He said perhaps there is no other means through which the issue of equitable distribution of water could be solved, as the construction of this link canal would be a step forward in this direction. Regarding the issue of unemployment, the Congress leader asked the government to fill up the vacant posts in various government departments and chalk out schemes to promote self-employment and small industries in the rural areas. The water consumption per person in Delhi and Kanpur was low, indicating a high deficiency of water. Also, the top three activities where wastage of water was highest were washing clothes (82 per cent), bathing (56 per cent) and washing utensils (49 per cent). Dr Abdul Shaban of the urban studies unit of Tata Institute of Social Sciences says stringent measures must be initiated by citizens to conserve water through efficient use. Ravi Pradhan, Indian manager for Via Technologies, a software company, says an “affordable computing solution lab”, which has been set up in the Indian Institute of Technology, Bombay, was the first step towards his goal. Mr Pradhan, who has spent 23 years with top IT companies in the US, is now working with major Indian IT companies on broadband and total connectivity that help leverage the PC infrastructure into home entertainment. The organisation accused the civic bodies and the police of harassing them in the name beautifying the city ignoring the fact that the proposal regarding the rehabilitation of the hawkers was under the preview of the Supreme Court. It has been put forth that cultural awareness needs to be created among all schoolchildren in Class I to VIII. The committee that met here yesterday felt that culture could be made a part of the curriculum through exposure to creative arts at the school level. Once the recommendations are finalised, students can have options to study art and culture and may be even offered specialised courses in the future, it was pointed out. Students who show inclination for the subjects will be allocated separate time to pursue them, it was mentioned. As for relying on the immediate environment, it was pointed out that cultural studies should not be seen as elitist in orientation. The members also expressed concern over the present status of culture education in schools, and said that cultural awareness may be assessed along with the other areas of learning. The meeting, which included Javed Akhtar, Shubha Mudgal, Krishna Sobti and Vinod Raina among others, was chaired by Prof U. R. Ananthamurthy.